The chunky Mary is from this set. ... is a book you'll see in many atria across the country, including ours. We don't use it much, though, so I recently created a new "Fetch" work (similar to other classic Montessori fetching games) with this book, some letters my daughter had made out of Perler beads, and the items in the Atrium. It was a hit! 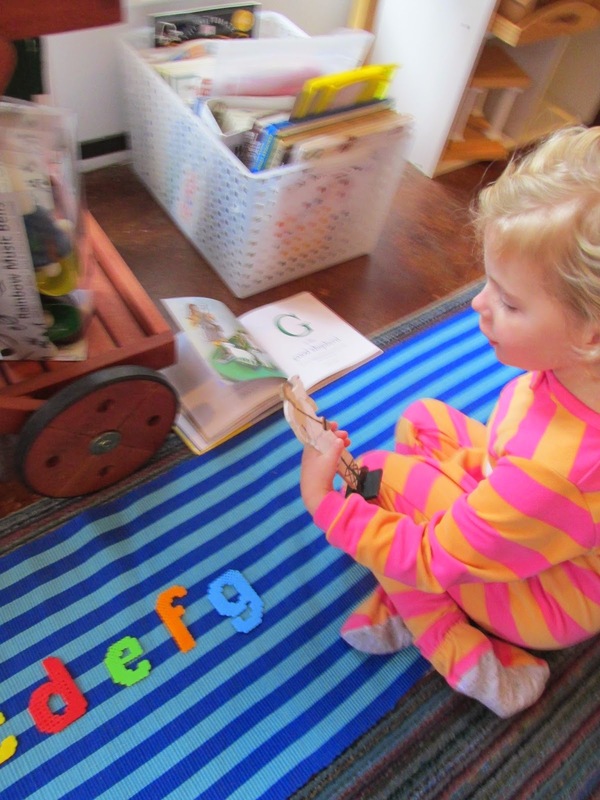 You could use the Moveable Alphabet, too--we just wanted to put these recently-made letters to use. 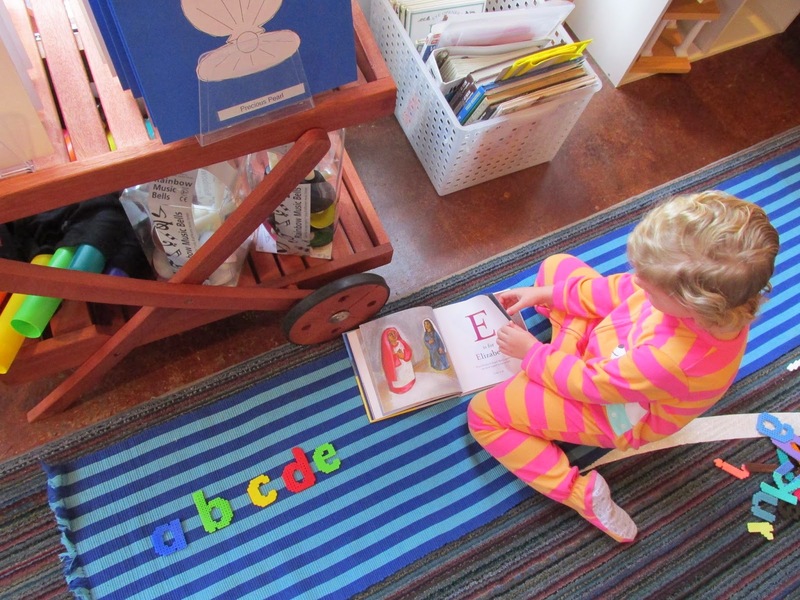 We just laid out a long mat, arranged the letters from left to right (saying the letter sound as we did so) and began to find things in the Atrium that were in the book and started with the letter. After we were done with each letter, we returned the items to their proper place. The whole work took about 45 minutes. (It doesn't matter what style of letters you use--even those plastic magnetic letters would be fine for this.) It was a GREAT way to work some movement into our cold, gray morning! Also, it could easily be done with a friend or two. the illustrations in the book with what we have in our Atrium. It was a great way for "Alleluia" to incorporate all that she has learned in the Atrium so far! We had to look for things from early works, later works, and really think hard to guess what would be on the next page (we tried to guess what would represent each letter before turning the page). ... and "t" is for Temple. Were you wondering what the "x" word would be? It's "crucifix." Note: My daughter "Peel," who is in 5th grade, made the letters when she was bored one day and had a lot of time on her hands. She used this pattern book, but you could use any sort of template you'd like, including one like the cursive Sandpaper Letters. If you have enough of each color, you could also stick with just red and blue, to match your vowels and consonants. Also, we had to tweak the design of the letter "a" to match what we use in the classroom.